A cute and funny toy frog comes in handy during a visit to the conveniences. Always at the ready to satisfy your toilet paper needs is this funny little frog. A novel way to dispense toilet paper, albeit distracting in a funny kind of way. The village of Gourdon is situated high up in the Alpes Maritimes region of the Provence, on the edge of a rocky point above the Loup River and at the entrance to Gorges du Loup. From the town square, there are stupendous views all the way to the coast. In order to reach the town square, you first wander pass a medley of boutiques, perfumery, and souvenir stores which is where this funny little toilet paper dispensing frog was seen. 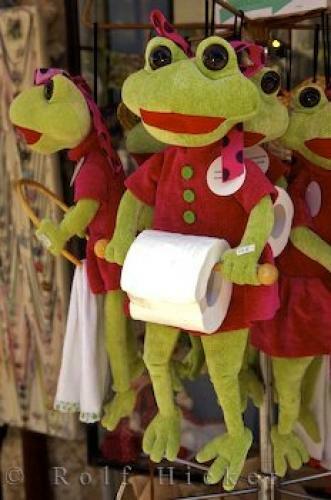 Frog toilet roll holders on sale in the village of Gourdon, Alpes Maritimes, Provence, France, Europe. in the village of Gourdon, Provence, France.